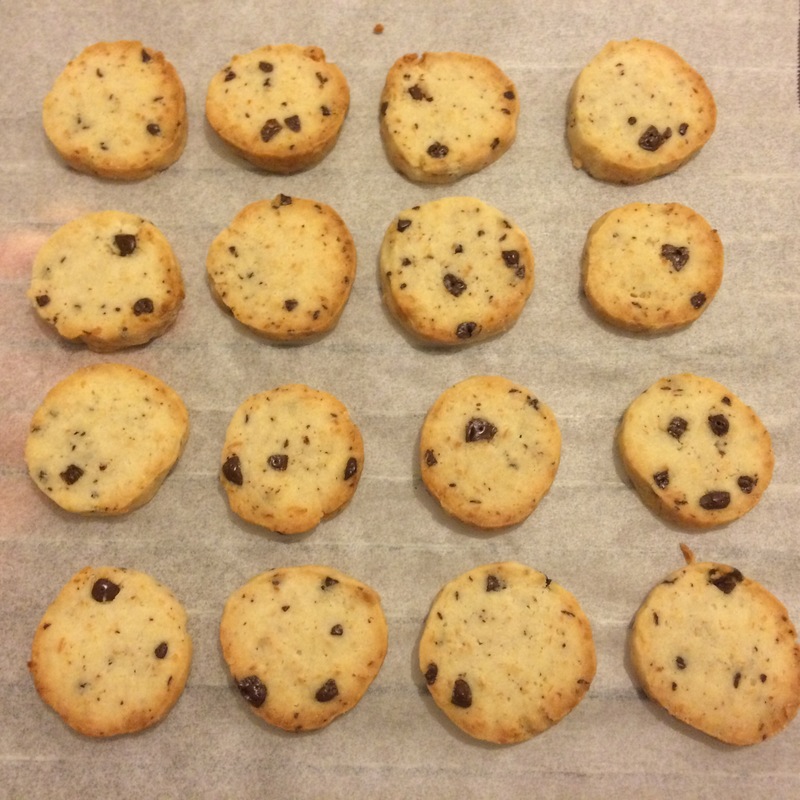 I can’t remember how I came across this recipe, but last week I found River’s recipe on Wing It Vegan for coconut oil shortbread biscuits! River came up with this recipe to keep her shortbread vegan; I’m not a vegan, I just like coconut and coconut oil. But I’ve never baked with coconut oil before, mostly because I’ve had no idea how to use it in baking! Which is why I was excited when I came across this recipe – I have heaps of coconut oil at home ready to go! 1. Scoop the coconut oil into a medium sized mixing bowl. The coconut oil should be solid but not hard like a rock. I microwaved mine for 15 seconds, and that seemed to do the trick. 2. Using an electric mixer on high, cream the coconut oil until it looks smooth and there are no visible chunky bits of fat. 3. Add the sugar, vanilla extracts, and water. Keep mixing on high until everything is well blended. 4. 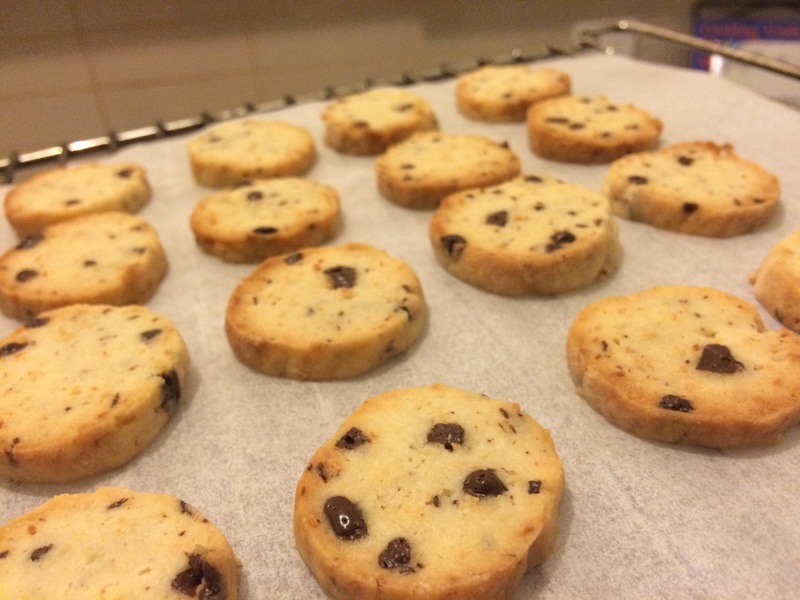 Use a large spoon to stir in the flour, coconut and chocolate chips. You can use your hands to knead in the last of the flour if it becomes too hard to stir. You should end up with a dough that resembles Playdough: not soft and soggy but also not dry and crumbly. If it’s too dry and not coming together you can add a little bit more water – I found that I did need a little extra water, about 2 teaspoons worth. 5. Now we need to shape the dough into a log. 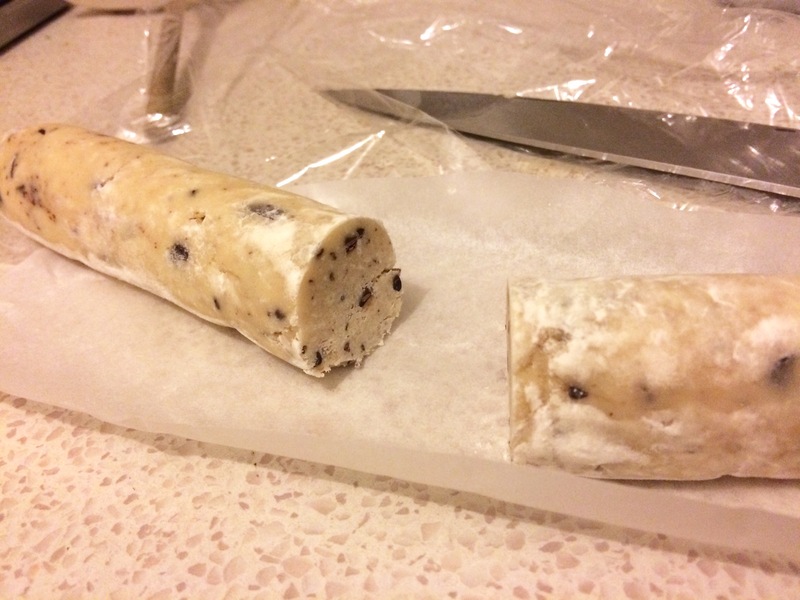 To do this you will need a piece of wax paper and cling wrap large enough to wrap the dough log in it. 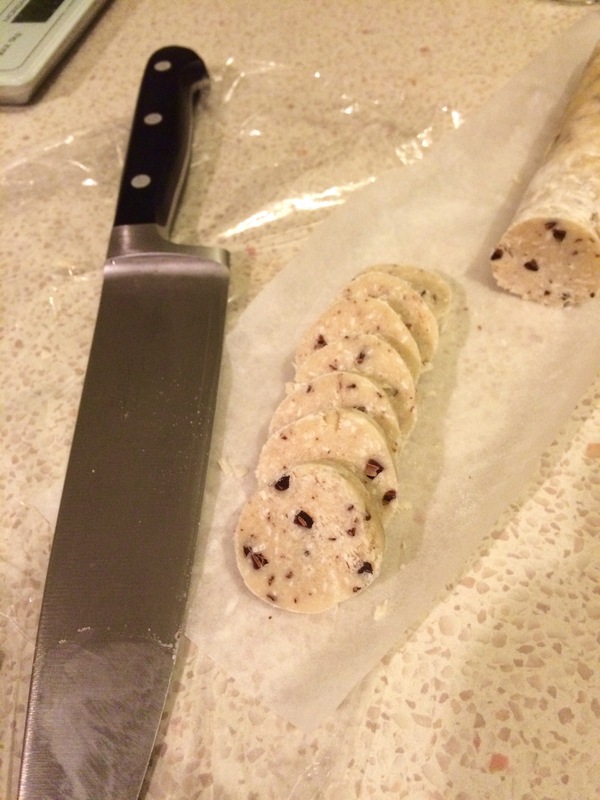 Sprinkle a bit of flour over the wax paper and place the dough right in the center. Use your hands to shape it into a log of your desired thickness, then wrap the paper around the log, followed tightly by the plastic wrap. Refrigerate the dough for about 30 minutes – I actually left mine in the fridge for around 2 hours, which made it super easy to slice. 7. Unwrap the log and use a sharp knife to slice the dough into pieces. I ended up with 24 cookies at the thickness I cut my dough, but this will be totally up to you. 8. Place the dough on the prepared cookie sheet, and bake for 18-20 minutes – until they’re just golden. So, how did they turn out? Really good!! I actually don’t think I’d change anything about them! They weren’t overly sweet, and the coconut oil actually wasn’t completely overpowering. If anything, I might use toasted shredded coconut instead next time, and maybe cacao nibs instead of chocolate chips (the only reason I didn’t use them this time was because I didn’t have any! ), otherwise, really happy with them 🙂 Thanks for the recipe, River!